What does CL mean on LG washing machine? I was using my LG washer and the digital screen displayed the CL code and flashes back and forth. All the buttons on the washer do not work. What makes the washer show CL on the screen? How do I clear it and get all the buttons to work again? I have never seen the CL code before and need to get this cleared so I can use the buttons again and wash my clothes. How do I turn off the CL code on my LG washing machine? To TURN OFF CHILD LOCK on your LG washer, press and hold the CHILD LOCK button for 3 to 5 seconds. The washer should now have CHILD LOCK mode DISABLED and all buttons will function properly. 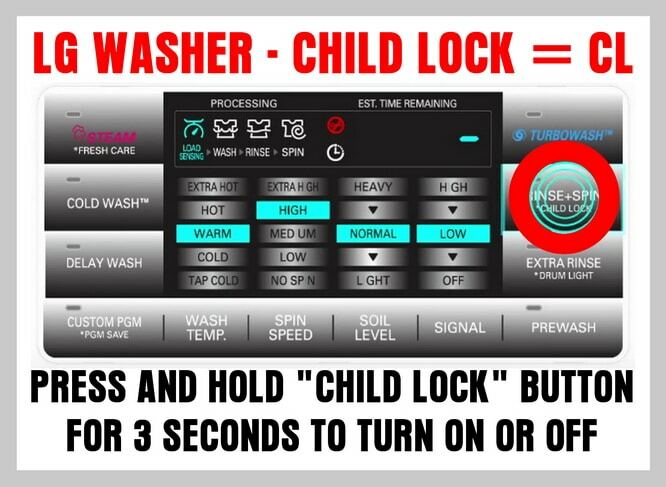 NOTE: ON other newer LG front load washing machines hold the PREWASH/CHILD LOCK button for 3 to 5 seconds to turn CHILD LOCK OFF. This method is for LG washers with inverter, direct drive, smart drum, and others. To TURN ON CHILD LOCK on your LG washer, press and hold the CHILD LOCK button for 3 to 5 seconds. The washer should now have CHILD LOCK mode ACTIVATED and all buttons will not function except the POWER button. 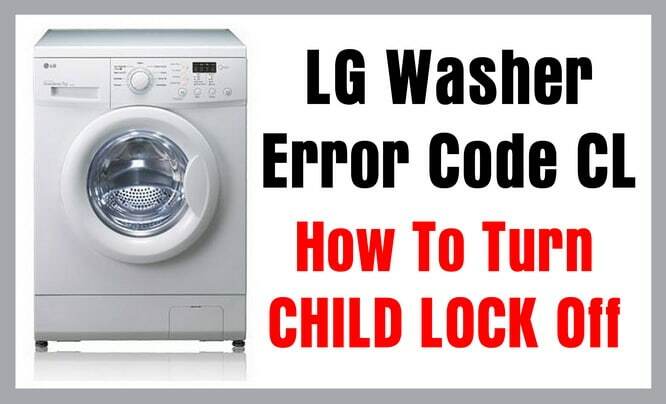 NOTE: ON other newer LG front load washing machines hold the PREWASH/CHILD LOCK button for 3 to 5 seconds to turn CHILD LOCK ON. On some LG washing machines that do not have a CHILD LOCK button, to TURN CHILD LOCK OFF, press and hold the TEMP and OPTIONS buttons at the same time for 3 to 5 seconds. Some LG washers have a little face above the lock key that is in between the WASH and RINSE buttons. If you have this on your LG washer control panel, simply press and hold the WASH and RINSE buttons for 3 to 5 seconds. The washer should now DISABLE CHILD LOCK mode and all buttons will function properly. On some LG washing machines that do not have a CHILD LOCK button, to TURN CHILD LOCK ON, press and hold the TEMP and OPTIONS buttons at the same time for 3 to 5 seconds. Some LG washers have a little face above the lock key that is in between the WASH and RINSE buttons. If you have this on your LG washer control panel, simply press and hold the WASH and RINSE buttons for 3 to 5 seconds. The washer should now ACTIVATE CHILD LOCK mode and all the buttons will NOT function except the POWER button. Child Lock function on your LG washer helps to prevent children from changing the cycle settings. 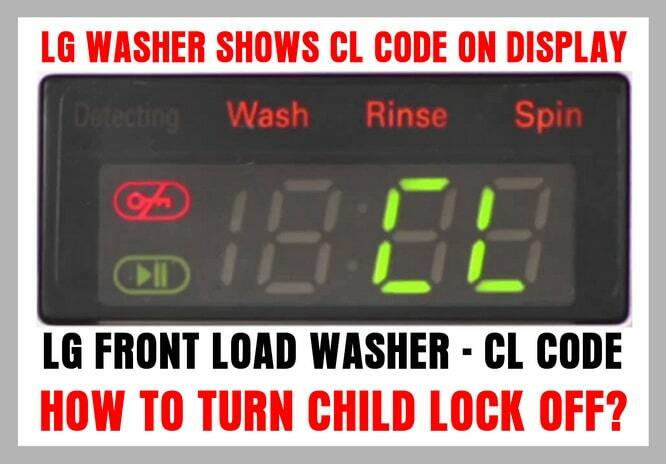 The Child Lock function prevents changing of wash settings by disabling the buttons on the display. 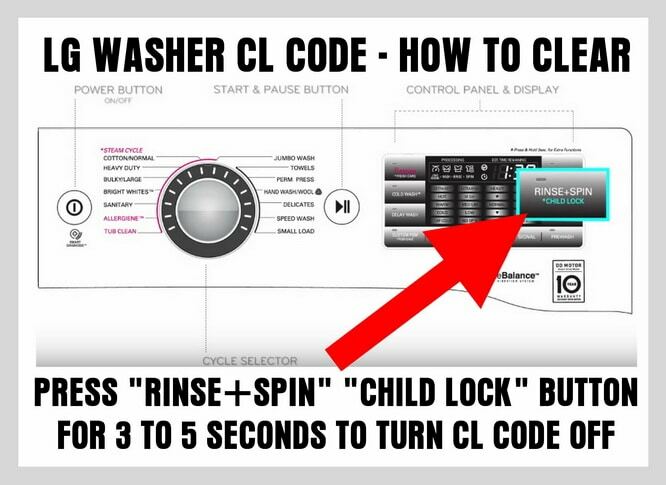 Have questions about the CL error code on your LG washer? Please leave a question below and we will be more than happy to assist you in turning it ON or OFF. I have a very old LG front load washer with CL on cannot get it off. Model number is WD-1243FHB. I have tried but can get it off. Any help would be great. I’ve google model number but only can find French instructions not English. Help! Can i reset my lg top loader Washer from CL being one so certain the proper way of disabling it is not working? I have a new top loading lg and I can not get the CL to turn off so the machine is locked up.What do I do? I have LG Washing machine F8068LDP, having blinking lights in the panel. Red signal is appearing on Childlock where I tried pressing Prewash & Premedic Rinse button for 5 seconds but no resolution of the problem. Please help me in resolving this error. I have the DLEY1901*E LG Washer (purchased in 2018) and the CL light is on. I have tried everything to get it off. I can’t use the dryer. HELP PLEASE! I dont know how it locked, I tray to hold on this ikon, but not working. Thank you sooo much! Glad to learn that this issue was an easy one to resolve without the assistance of a service technician! Thank you so much!! My LG is brand new, 2018 HE top load, so the buttons are a little different, Mine is on the bottom right. The large word is “Signal” and the * word beneath it is “control lock”. If it weren’t for you, I would have had to call LG to help me! (face palm) The worst part is that the CHILD turned it on somehow by messing around. I have a new lg washer & dryer, just delivered yesterday. My CL light is light up on the dryer. I don’t have a CL button, or other buttons that are mentioned. How do I get my dryer working again? Press and hold RACK Dry button is to be used to reset Child Lock for DLEY1701 LG Dryer. Press and hold SOIL Level button is to be used to reset Child Lock for WT1701C LG Washer. I cannot deactivate child lock CL on my LG F8068LDP washing machine. To disable CHILD LOCK when the CHILD LOCK is activated press and hold the PREWASH button for 3 seconds during the wash cycle. CHILD LOCK lasts after the end of the cycle. If you want to deactivate this function press and hold the PREWASH button for 3 seconds. 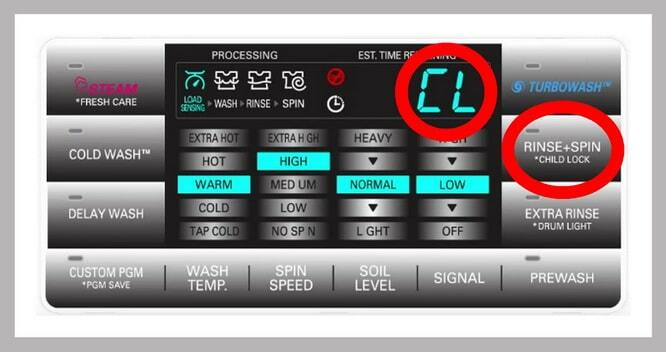 I have LG WM-1480FHD; The main PWB failed put direct replacement in, powered on and display registered CL child lock on this washing machine year 2001 icon on facia shows to hold both WASH with RINSE down for more than 02 seconds; even at 60 seconds the display will not revert to time.How can I resolve this fault ?